GermGuardian AC5300B is indeed the popular GermGuardian AC5000 version coated in the modern appearance of the GermGuardian CDAP5500BCA. Today, we will guide you through a quick GermGuardian AC5300B Review to show you how efficient this air purifier of Guardian Technologies is. Walking through the list of GermGuardian‘s low-range army, we can easily spot the GermGuardian AC5300B. This unit remains same power with the classic GermGuardian air purifiers, while improving with a new and modern appearance as the latest devices of the same brand. If you are just willing to pay about $100 for an air purifier, would you choose GermGuardian AC5300B or not? We hope that this GermGuardian AC5300B Review will help you answer it. Using the old air filtration technology from GermGuardian, GermGuardian AC5300B is even more affordable than the famous low-range GermGuardian CDAP5500BCA. This air purifier has an easy price tag of $129, which is $10 higher than the previous GermGuardian AC5000. Also, if you are sticking with this GermGuardian AC5300B, you can purchase it with ease with the deal below. GermGuardian AC5300B 28-Inch Tower Air Purifier with Black Onyx Color. Modern appearance for your beloved GermGuardian AC5000. Are you curious? Not like the upgraded GermGuardian AC5350B, this GermGuardian AC5300B has only one Black version. Guardian Technologies could easily deceive anyone to buy the wrong product from their stores if they really want. GermGuardian AC5300B has nearly everything to be mistaken with the latest tower air purifier – CDAP5500BCA, with a pure plastic GermGuardian’s design. This could be the best way to make a GermGuardian AC5000 model look more expensive and beautiful. From the front, this style is truly the last year’s style of GermGuardian, with a circular light to indicate the current air quality in your room. From the back is the same intake air grill of GermGuardian air purifiers. The air flow will come polluted from the back and fresh from the front. With a 28-inch tower air purifier like GermGuardian AC5300B, it is quite difficult to maximize the efficiency of this air purifier. If you want to know why, you can read from the previous CDAP5500BCA Review. At the top, the control panel is not as modern as the latest CDAP5500BCA, but is still useful with 2 buttons and a LED filter replacement indicator. This unit is really light-weight with 11 lbs. It is possible to move the GermGuardian AC5300B anywhere in your home. 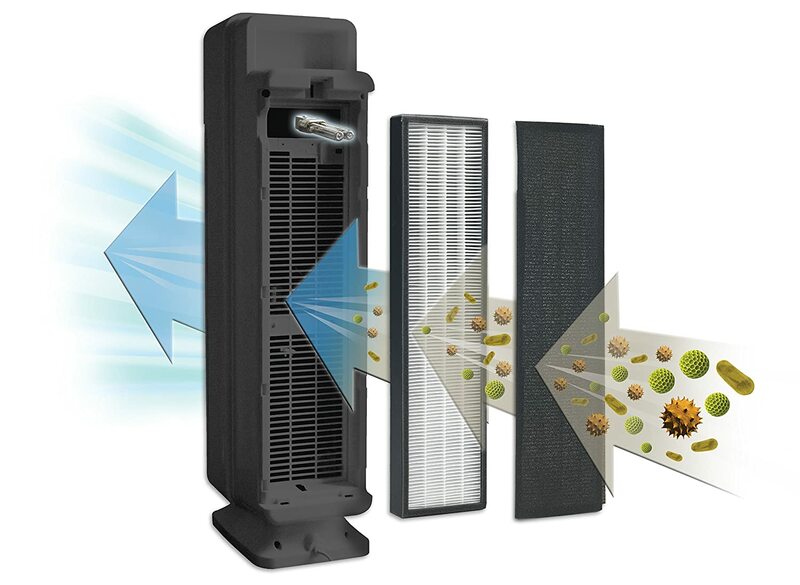 True HEPA filter – GermGuardian AC5300B uses a True HEPA Filter to capture 99.97% of microscopic allergens, dust and mold spores down to 0.3 microns in size. GermGuardian AC5300B is running a 3-in-1 air cleaning system from GermGuardian, which isn’t the latest technology of this brand. But it is indeed very similar to the latest GermGuardian’s 4-in-1 air cleaning system. We have tested both these classic GermGuardian AC5300B and GermGuardian AC5000 in standard conditions and it is safe to say these two pass the testing criteria easily. They all has an impressive efficiency of trapping 99.9% as small as 0.3 microns particles. With an addition of an UV-C light bulb, the 3-in-1 air cleaning system from GermGuardian is still formidable in capturing and killing the allergens like dust, dust mites, pet hair, pet dander, bacteria, mold and fungi. Remember that you can use the same filter in previous models like CDAP5500BCA, AC5250PT, AC5000, AC5350B. That means you don’t need to pay an extra of $70 to use the best air filter of Guardian Technologies. It should also be noted that today Guardian Technologies has two layers of True HEPA filter for different purpose. The last but not least, you need to change the air filter every 6-8 months base on 24/7 use. A typical GermGuardian air purifier is mostly suitable for a room coverage less than 200 sq ft. As a classic one from the brand, GermGuardian AC5300B will hold up to 167 sq ft. The ACH of GermGuardian AC5300B is 4X. 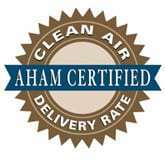 This air changes per hour rating is similar in all tower air purifiers of this brand. The CADR of GermGuardian AC5300B is 114 Dust/ 108 Smoke/ 127 pollen (cfm). This CADR rating of the $129 air purifier is exactly the same with the GermGuardian CDAP5500BCA. Using only 3 fan speeds, GermGuardian AC5300B reduces most of the noise level created by the highest setting in a GermGuardian 5-fan-speed air purifiers. However, we still notice a noticeable sound when using GermGuardian AC5300B at full fan speed. If you are planning to have an air purifier for a quiet space, GermGuardian AC5300B is okay, but not the best choice of yours. With a new built-in 5W UV-C bulb, GermGuardian AC5300B consumes less energy than the predecessor GermGuardian AC5000. The power consumption is recorded at 60W, which is much higher than the energy-saving air purifiers like AeraMax 200, Levoit LV-H132, Winix 5300-2 or Blue Pure 411. For using a GermGuardian AC5300B 8 hours per day, it would cost you up to $22 per year. 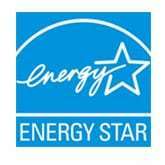 Yes, for an Energy Star device, you could expect such low energy cost. Don’t be deceived by the modern looking of GermGuardian AC5300B, it is not the CDAP5500BCA with the latest additional features. You won’t have either Wifi capability or the Smart Sensor. The only feature you will have is the necessary LED indicator for filter replacement. Well, better than nothing, right? If you are truly in need of better additional features, you can pay up a little for the successor GermGuardian AC5350B, or save up for a real GermGuardian CDAP5500BCA. This GermGuardian AC5300B is indeed a more affordable GermGuardian CDAP5500BCA with no wifi capability or any smart features. Instead, this air purifier is only for the one who focus on the air filtration process and the performance rating. For the price, Guardian Technologies prioritizes the technology in exchange of the weak fan power. So make sure to just choose this air purifier for personal use. Should I buy GermGuardian AC5300B? Yes, but only when you like the design of this modern GermGuardian AC5300B. Otherwise, a GermGuardian AC5250PT is better. If you have serious allergies or asthma to airborne pollutants: the GermGuardian AC5300B is great with the combination of True HEPA filter and UV-C light filter. If you need an air purifier with a better room coverage: you can choose the SilverOnyx, Alen Paralda or Alen T500 with manufacturer’s suggested room size of 500 sq ft. The Winix 5300-2, Winix C535 and Winix 5500-2 can clean a room of 360 sq ft, and they are double the room size of this GermGuardian AC5300B. 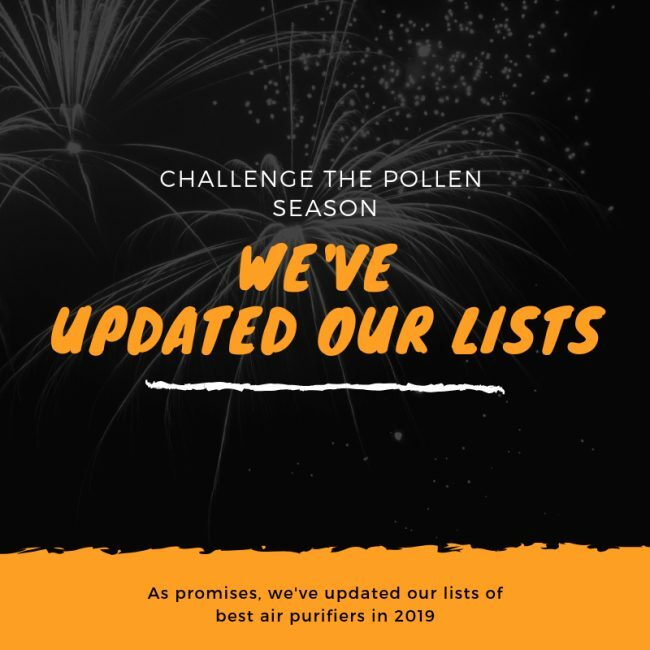 If you need a budget version of this air purifier: you should opt in for the GermGuardian AC4825, GermGuardian AC4300BPTCA or GermGuardian AC4900CA. If you love the additional features: you can get the Blueair Sense+, Honeywell HPA250B or GermGuardian CDAP4500BCA, for both Smart Sensor and Wifi capability. Another GermGuardian option in low-range segment, with modern appearance.